People with heartburn may experience chest pain that can easily be confused with the pain of a heart attack. That's why it's so important to undergo testing and get properly diagnosed. Most people do not experience any symptoms of their hiatal hernia so no treatment is necessary. However, the paraesophageal hernia (when part of the stomach squeezes through the hiatus) can sometimes cause the stomach to be strangled, so surgery is sometimes recommended. Other symptoms that may occur along with the hernia such as chest pain should be properly evaluated. Symptoms of GERD, such as heartburn, should be treated. 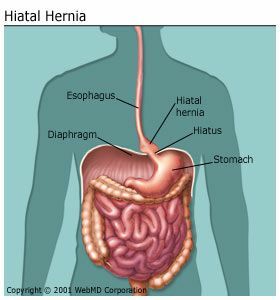 Hiatal hernia surgery can often be performed as a laparoscopic, or "minimally invasive," procedure. During this type of surgery, a few small (5 to 10 millimeter) incisions are made in the abdomen. The laparoscope that allows the surgeon to see inside the abdomen and surgical instruments are inserted through these incisions. The surgeon is guided by the laparoscope, which transmits a picture of the internal organs to a monitor. The advantages of laparoscopic surgery include smaller incisions, less risk of infection, less pain and scarring, and a more rapid recovery. Many patients are able to walk around the day after hernia surgery. Generally, there are no dietary restrictions and the patient can resume his or her regular activities within a week. Complete recovery will take two to three weeks, and hard labor and heavy lifting should be avoided for at least three months after surgery. Unfortunately, there is no guarantee, even with surgery, that the hernia will not return.